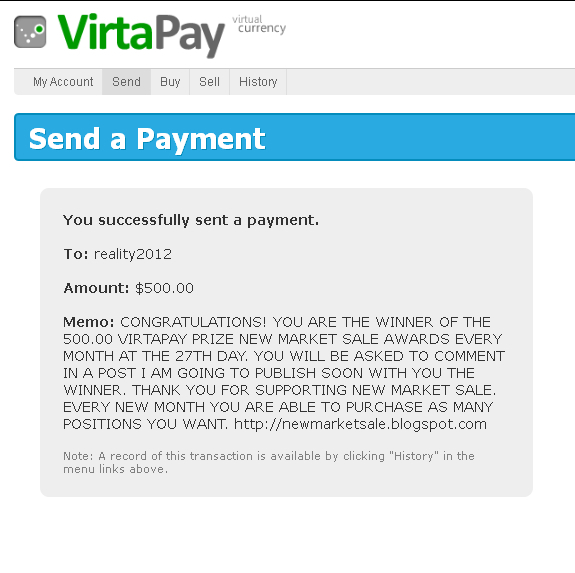 New Market Sale: $500 VirtaPay Prize Winner for The 27th August Announce! $500 VirtaPay Prize Winner for The 27th August Announce! The account id for the $500.00 VP this Month is, reality2012! Congratulations! Thank you for supporting New Market Sale to grow. From today, you can continue participating by buying a position for the Next Months 27th Contest. Its a great effort to motivate the virtapay customers.